We consider discrete time branching random walk on real line where the displacements of particles coming from the same parent are allowed to be dependent and jointly regularly varying. Using the one large bunch asymptotics, we derive large deviation for the extremal processes associated to the suitably scaled positions of particles in the nth generation where the genealogical tree satisfies Kesten-Stigum condition. The large deviation limiting measure in this case is identified in terms of the cluster Poisson point process obtained in the underlying weak limit of the point processes. As a consequence of this, we derive large deviation for the rightmost particle in the nth generation giving the heavy-tailed analogue of recent work by Gantert and Höfelsauer . Bhattacharya, A. (2018). 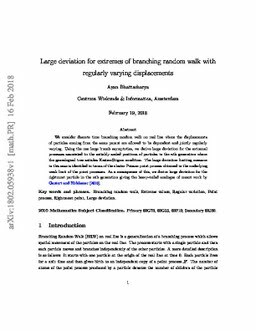 Large deviation for extremes of branching random walk with regularly varying displacements.